Be careful what you wish for…! I volunteered to check out a new line of LED dimmable household bulbs from OSRAM SYLVANIA, wondering at the time where I would test them. Almost immediately, light bulbs that had lasted fifteen years began to burn out all over the house! I no longer had to worry about test locations, but rather whether these bulbs would prove worthy enough that I would go buy more of the same to fill my empty sockets. Read on to learn the answer. OSRAM SYLVANIA sent me an assortment of four bulbs from their new A-Line LED products. “A-Line” refers to the physical form factor – “A” is the familiar shape of incandescent lamp bulbs with a screw-in base that have been around since their development by Thomas Edison. Most single-wattage incandescent bulbs are the A19 form factor; larger bulbs like 3-way are A21 or A23 (the number is the nominal bulb diameter in eighths of an inch). With most people still accustomed to thinking in terms of incandescent wattage as a brightness scale instead of lumens, LED bulbs are marketed as replacements for the equivalent-wattage incandescent bulb. I received 40-, 60-, 75-, and 100-watt replacement LED bulbs. They are all dimmable, a fairly recent advance in LED technology. The new technology, “LED,” is highlighted in huge type. The replacement wattage, so you know which bulb to select, along with the lower actual wattage used. The long life – “22+ years!” – which is actually 25,000 hours of continuous use versus typical 1,000-2,000 hours of use for incandescent bulbs. Low ($0.72-$2.29) estimated energy cost per year. 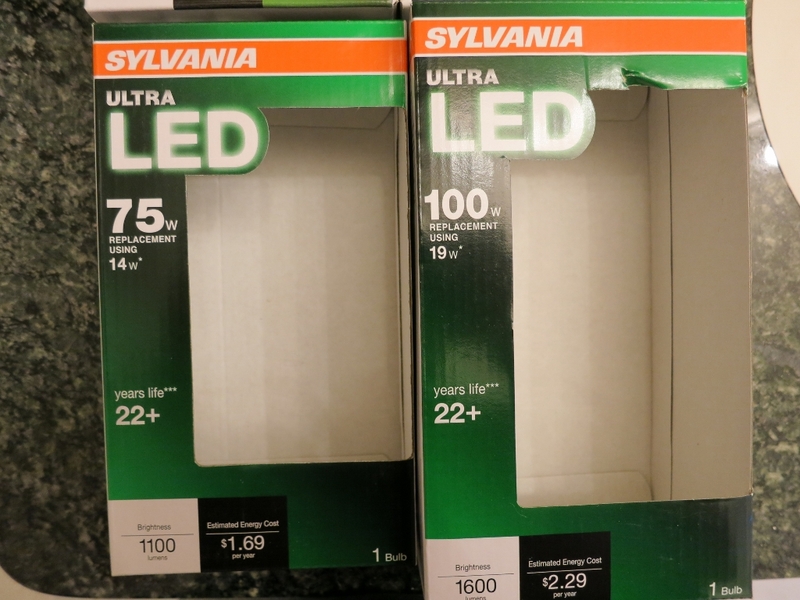 The manufacturer for the two smaller bulbs is shown as OSRAM, while the larger two show SYLVANIA. OSRAM purchased SYLVANIA in 1993 and OSRAM SYLVANIA now markets lighting products under various brands. Note: All images can be clicked to view a larger size. The ULTRA LED bulbs are made in China and come with an impressive 5-year limited warranty. All the bulbs in this ULTRA line that I received are “soft white,” meaning that, at a rating of 2700K color temperature, they are at the warmer end of the white spectrum that incandescent bulbs occupy and which must of us have come to prefer for general home lighting. Three other newly-introduced bulbs that I did not receive for review are “natural daylight” (5000K) bulbs that are cooler (bluer) and more suitable for task and office lighting. If you’ve been ignoring the recent ad blitz for LED bulbs, the manufacturers are making a big push to replace your incandescent bulbs – aided by government regulations phasing out sales of the older technology. The reason is energy conservation, with LED bulbs currently running about five times more efficient than incandescent bulbs. 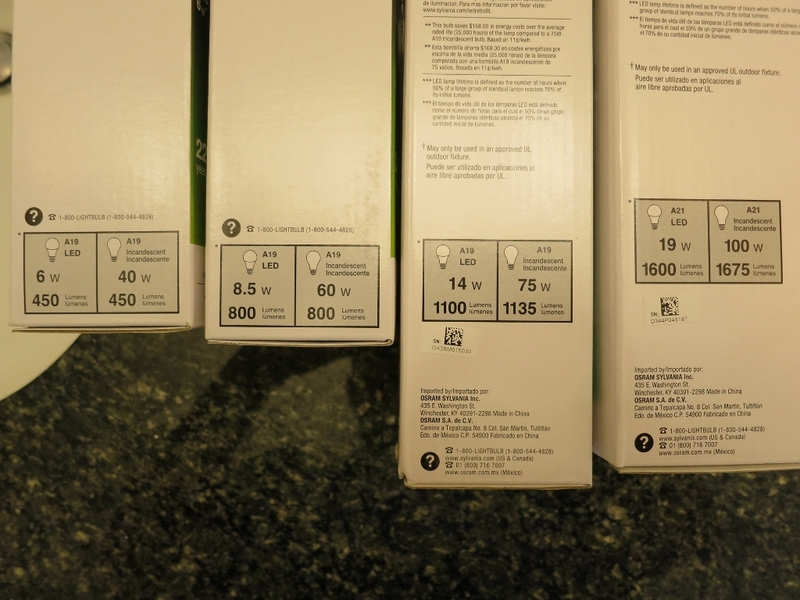 You can see that in the picture above, where the labels show the actual wattage and lumens of the LED bulbs compared to their incandescent equivalents. Energy savings, together with a life span measured in decades, are supposed to offset the initial sticker shock. Even the price has been dropping rapidly as manufacturing volumes have ramped up. The bulbs in this review retail in the $8-22 range; while that is an order of magnitude greater than equivalent incandescent bulbs, the life expectancy is also ten times greater. Factor in the energy savings, and you shouldn’t be too unhappy to make the LED investment as long as it works just as well as the old-fashioned bulb. It turns out that, despite improvements, there are still differences with LED bulbs that can be annoying, especially in the higher-wattage bulbs that are just coming to market. One is the weight: the 100W-equivalent ULTRA bulb tipped the scales at 11.5 ounces compared to the 1.3-ounce incandescent bulb. Some fixtures are not designed to handle that kind of weight, and some lamps could be more likely to tip over, so be careful. LED bulbs are also likely to be larger, especially at the high end. The photo below shows a standard 100W bulb in the middle, with the huge 100W-equivalent LED ULTRA on the left and the 60W-equivalent LED ULTRA on the right. One plus is that, with a lower wattage, LED bulbs do not emit as much heat as incandescent bulbs. This can be a great thing on a hot summer evening. Again be careful, however, because many LED bulbs come with a warning like the one on these ULTRA LED bulbs: “Do not install in totally enclosed recessed fixtures.” The electronics in LED bulbs are sensitive to heat, which can drastically reduce the expected lifespan of an LED bulb if it is not well-ventilated. Some LED bulbs – not the OSRAM ULTRA LED – are designed to dissipate heat build-up better than others and don’t carry this warning. Seek those out, or stick with incandescent bulbs for now, for enclosed lighting applications. Another factor to consider with LED bulbs is the direction that the light is focused. Typical incandescent lights are “omnidirectional” throwing light in all directions except straight through the base. With frosted bulbs, that light is also very even. 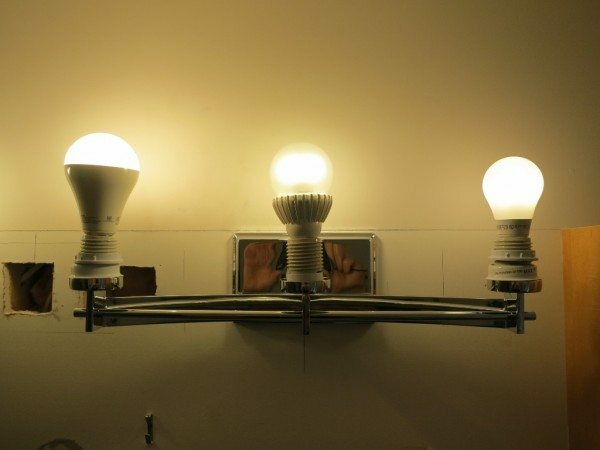 Due to the added electronic circuitry in the base, LED bulbs have a tougher time casting uniform, omnidirectional light. Some bulbs attempt this with varying degrees of success, while others retract the omnidirectional claim altogether. 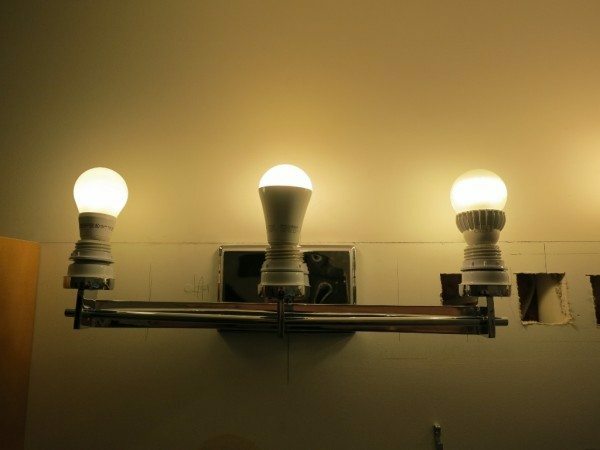 The two larger ULTRA LED light bulbs (100W and 75W equivalents) have a solid lower half, only emitting light through the upper hemisphere of the bulb. This works okay for some applications, but not others, as I discovered. As it happened, I had lots of opportunities to see how well the LED worked as a replacement for my rapidly-failing incandescent bulbs. 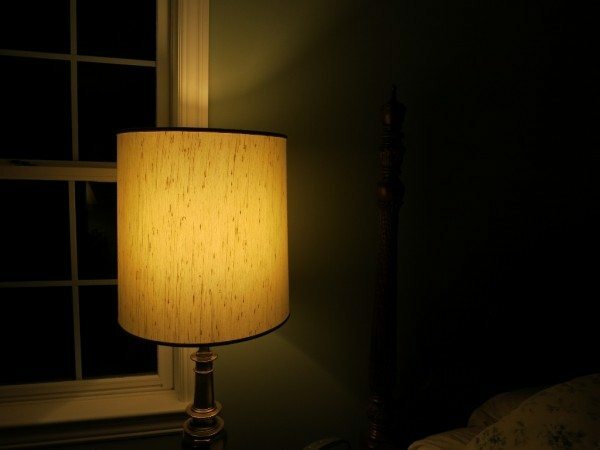 The first test was my bedroom lamp. The top photo is a 100W daylight bulb, and the bottom is the ULTRA LED 100W-replacement. Due to automatic exposure compensation, it is misleading to judge relative brightness from photos. 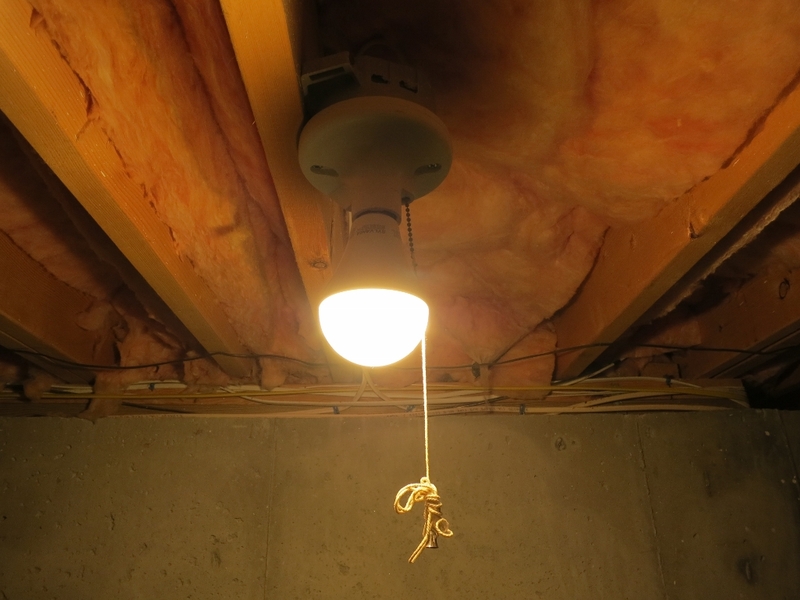 What you can see is that the “soft white” color of the LED is yellower/warmer than the daylight incandescent. More important, you can see that the bottom of the lampshade is a bit darker in the lower photo because the LED bulb casts most of its light upward. However, the glow of the lampshade itself mitigates most of this effect, and I didn’t really notice this until I looked for it. I found the UTLRA LED 100 to be a perfectly satisfactory replacement for this table lamp, with one caveat. The table lamp, like many others in our house, is designed for 3-way light bulbs. The bulb I removed, in fact, was actually a 50-100-150-watt bulb with the 50W filament burned out. I’m already used to twisting the switch 2-3 clicks to turn on the light and 1-2 clicks to turn it off, just as I must do with the LED bulb. 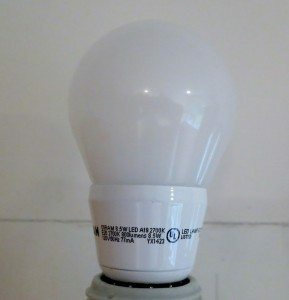 If I wanted a 3-way bulb, however, I’d have to settle for a relatively anemic 40-60-100-watt replacement LED (not offered in the ULTRA line). Now that I do my bedtime reading on a Kindle Paperwhite, with its own illumination, I no longer require 100W+ beside my bed. Nevertheless, I don’t see much value in lowlight 3-way bulbs and wouldn’t suggest switching to LED bulbs as 3-way replacements (yet). Next, I moved to the basement, where a 100W incandescent bulb had just burned out at the bottom of the stairs. Adding insult to injury, I moved another incandescent bulb to that fixture to take a baseline photo, and that bulb suffered the most annoying demise of all when the glass bulb separated from the base. As I worked the metal base free with a pair of pliers, I was ready to accelerate the banishment of all incandescent bulbs from my house! The photos clearly show the directional nature of the ULTRA LED 100 bulb. For a ceiling light, that’s actually a positive feature. The old bulb not only lit up the ceiling unnecessarily, but also wasted much of its light doing so. The ULTRA LED 100 actually appeared glaringly bright compared to the old 100W bulb in this application. When I replaced it with the ULTRA LED 75, I was much happier with the result. 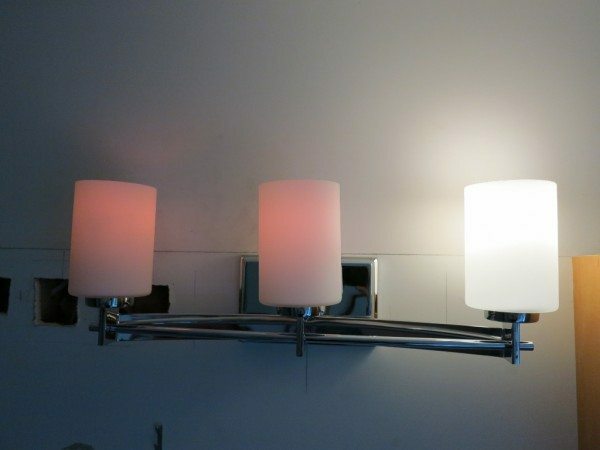 The new light fixtures consist of two 3-bulb fixtures, with each bulb enclosed in a frosted glass sleeve. My main concern would be the evenness of the light distribution, given my experience with less than omnidirectional lighting from LED bulbs. 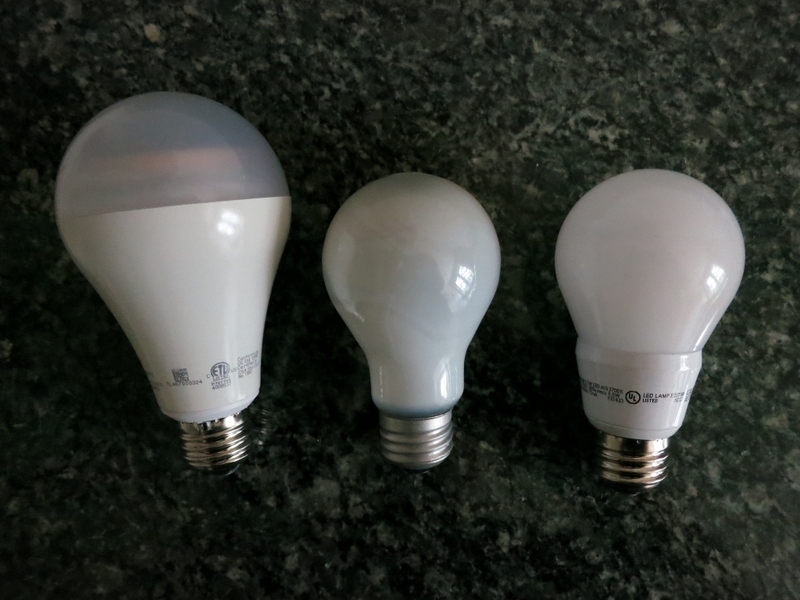 I brought my LED ULTRA bulbs and two incandescent bulbs with me to compare the performance. I also brought another LED bulb to the picnic, the highly-advertised Cree light bulb. While the ULTRA LED bulbs have a semi-exclusive relationship with Lowe’s, Cree has a similar relationship with Home Depot. I would pit two featured LED technologies against each other. One reason for this choice is that Cree specifically claims “omnidirectional” quality. You can see that the Cree 100W bulb on the right below does look like it might have a wider light field the than ULTRA LED 100 , although probably not as wide as a conventional bulb. Here is my initial test lineup on one fixture. From the left are the ULTRA LED 60, the ULTRA LED 100, and the Cree LED 100. The lower-wattage ULTRA LED 60 appears to have the widest light field but, as expected, it didn’t provide as much light as I wanted. Here we have the ULTRA LED 75, the Cree LED 75, and the ULTRA LED 40. When I added the glass enclosures, I immediately had to scrap the 100W-equivalent bulbs from both the ULTRA and Cree lines. Neither of these bulbs were physically small enough to be used in this application. They just barely fit inside the diameter of the glass and stuck out the top. So the picture below just shows the remaining candidates. You can see that the ULTRA LED 75 on the left is really still too tall and, worse, its directional nature only lights up the top inch of the frosted glass. The Cree 75 in the middle is better, but still provides uneven light. The ULTRA LED 40 on the right is the best of the three, but still provided neither as bright nor even a light as I had hoped. I brought in the incandescent lights, and there was just no comparison. The new bulb in the middle is a SYLVANIA 60-watt daylight incandescent bulb. It is a clear winner in providing a pleasingly even glow from within the frosted glass. The good news is that I had six of them in the closet. The bad news is that you can’t buy them anymore! I’m using them for now and hoping that I can find a satisfactory LED product before one bulb burns out or before they provide unwelcome heat next summer, whichever comes first! 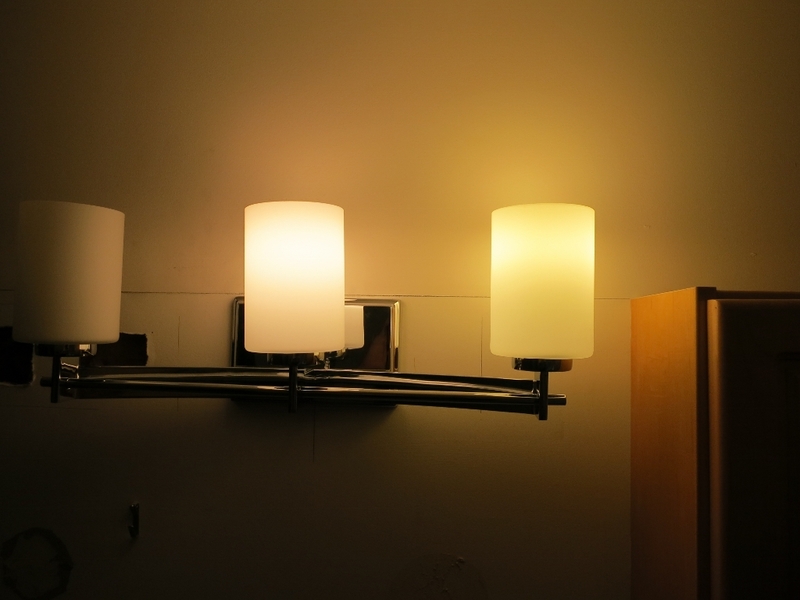 One final note from the bathroom: ULTRA LED bulbs are dimmable but not as simply or to the same degree as incandescent bulbs. An LED dimmer switch has a control to help adjust different wattages to as low as they will go before they display an annoying flicker. This point will not be as dim as incandescent bulbs. The picture below shows two incandescent bulbs and the ULTRA LED 60 at their lowest settings. The lights are actually dimmer than the photo makes them look, but you can see that, relatively speaking, the LED bulb is brighter. This wasn’t something I cared about in the bathroom, but might be something to consider in other locations. My last application was a burned-out 60W bulb in my garage door opener. Here, unfortunately, I felt that I couldn’t use the ULTRA LED 60 bulb due to the package warning that it shouldn’t be used in an enclosed fixture. I probably could have ignored this warning because the garage door opener light times itself off after a couple of minutes, greatly reducing the possibility of overheating. But I found another LED bulb at my electrical supply store without the warning and installed that instead. It works fine (and does not interfere with the radio signal that remotely operates the door, as I had read that some LED bulbs are prone to do). So this was a good place for an LED bulb, but not the ULTRA LED. In the end, I successfully deployed three of the four ULTRA LED bulbs in my house. 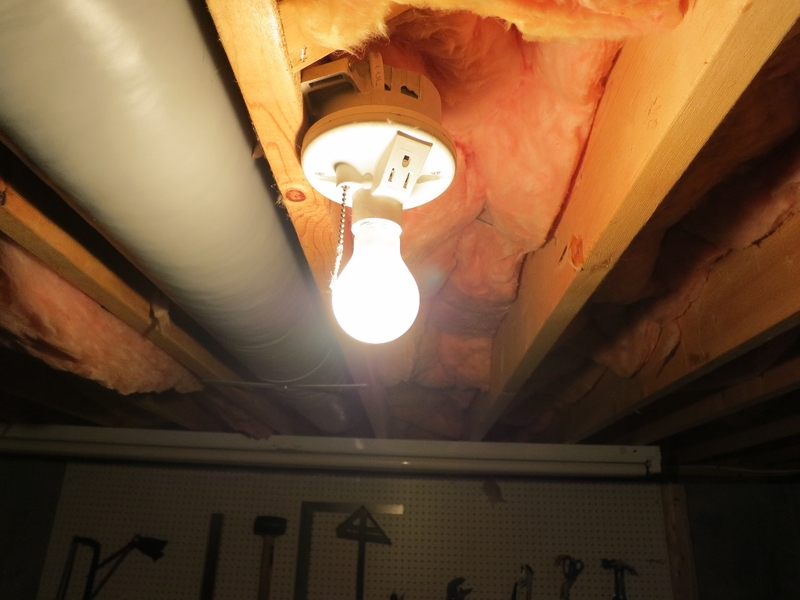 The 75-watt equivalent made a great naked overhead light in the basement. It provides plenty of light where it’s needed with 14W instead of 100W. Unlike some of the compact fluorescent lights (CFLs) that I had been experimenting with, it also achieves full brightness with no delay, an important consideration when heading down dark basement stairs! The 100-watt replacement ULTRA LED found a home in my bedside lamp, where it looks just as good as the 100W bulb it replaced, for an 81% energy reduction. The 60-watt UTLRA LED similarly found itself in a lamp next to our family room sofa, freeing up one of the now-precious 60-watt incandescent bulbs for use in the bathroom fixture. I don’t know where I could use the ULTRA LED 40 as I don’t use many bulbs that dim. I wish I could use it in the vent over our kitchen stove, where the existing light bulb is hot enough to have singed its plastic cover, but unfortunately these bulbs are not designed for that purpose. The upshot is that you can probably benefit from these ULTRA LED bulbs. They work great as replacement bulbs in many common household applications. However, they are definitely not a universal replacement, especially where bright, omnidirectional light is required, or in enclosed fixtures. LED technology is advancing rapidly, so I expect that bulbs (or fixture redesigns) will come along to address these deficiencies as well. Meanwhile, it’s time to jump on the LED bandwagon, and these ULTRA LED bulbs are a good place to start. Source: The samples for this review were provided by OSRAM SYLVANIA Inc. Please visit their site for more info about this product. Medium-base screw-in socket with a requirement for 450-1600 lumens to replace a 40-, 60-, 75-, or 100-watt incandescent light bulb. Great review, thanks. I’m running out of incandescents so was thinking of going to LEDs. This review has really helped – I’d never have thought about the weight. Happily, I have a decent supply of 75W and 100W incandescent bulbs remaining for which I paid approx. $.85 each. 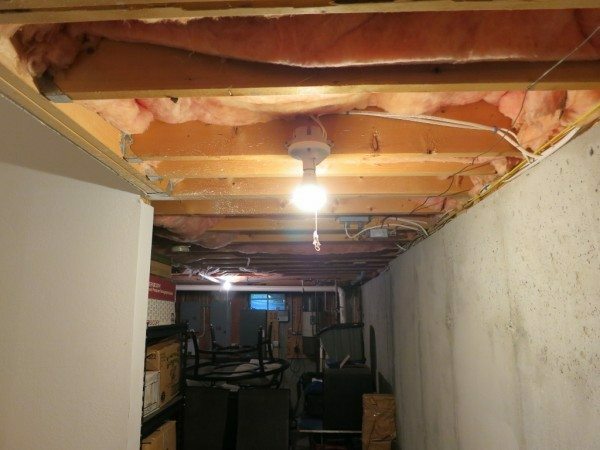 The review pointed to a problem I’ll have to deal with if I cannot locate a source for more… the three ceiling fixtures holding those incandescent bulbs are fully enclosed. Time now to plan ahead. Check out the new Cree 4Flow bulbs. 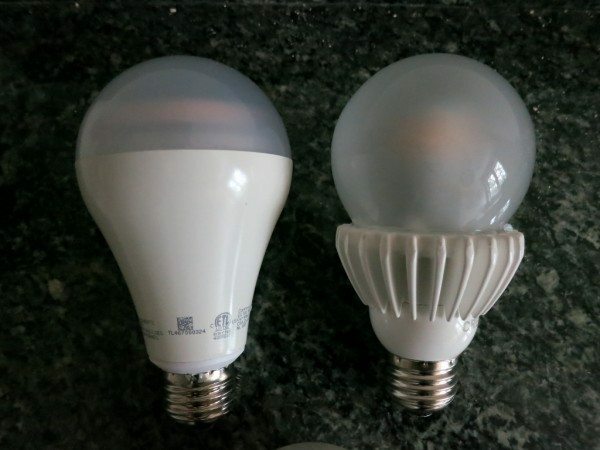 They spread light like regular incandescent bulbs, they look like regular bulbs (size/shape), and they are much lighter than their previous LEDs (1.96 ounces for the 60w equivalent). I just installed 3 in a totally enclosed light fixture, and they are working well. Sadly – so far they only have 40w and 60w equivalents. Look for “Rough Service Bulbs”. Those are an exception the “ban”. They are more industrial grade bulbs (meant to handle movement/environment” but produce the exact same light. I just installed these bulbs in the outside fixtures on my house and they are stellar. A word of caution though, I originally purchased the same bulb in the “Natural Daylight” variety, and they were abhorrent. The light was such a blinding shade of white that my wife asked if we were expecting spacecraft in the driveway. Lowe’s was happy to return them and I purchased the “Soft White” reviewed here. The review above is not a good presentation of the state of led bulbs on the market. I am a very picky person when it comes to lighting, yet in my opinion, there are many led bulbs to choose from that I would pick over incandescent. First of all, color temperature. If you like the very warm incandescent color that get warmer as it’s dimmed, then led won’t do it. I however prefer around 2800-3000 K temp light, and it’s easy to find LED that give me that. Plus, I like the fact that the color temperature remain constant throughout the dimming range. Many like the led I bought from Home Depot 3 years ago can dim to less than 10% which is as dim as I need them to be , about night light. The uneven lighting you see in those photos above are due to the shadow casted by the big base. The ones I had the base was small enough that the light is even as view through the lamp shade. I never really care for the very warm color of incandescent. I find it depressing. I think Phillips had some led that are that warm if that is your thing. Any how, there are a lot more choice in color for led that there are for incandescent, and many of them are pretty light so weight should not be a problem. @steve, I’m an engineer myself and appreciate the need for precise language, in spite of attempts by marketing to blur distinctions! The OSRAM SYLVANIA website itself frequently uses the term “light bulbs” and it’s common terminology which I felt comfortable using. @Run Buh and @meistervu, I realize that the applications I focused on were skewed toward higher lumens. While LED technology comes closest to matching the performance of 40W and 60W incandescent bulbs (lamps! ), I mostly needed brighter light than those could provide. This is where I pointed out that LED technology can still fall short in providing omnidirectional light in the expected size and weight of a replacement bulb. Nevertheless, LED can be as good as or better than incandescent in many applications. @John, Thanks for the input on the “Natural Daylight” bulbs, which I did not cover in my review. Like meistervu, I often find incandescent lighting to be too yellow, but light that is too harshly cool can be even more annoying. I do like the balance that most of the soft white LEDs seem to have hit. I see, so you are focusing on the 75-100 Watts replacement. Luckily I designed the house I live in and the lighting as well so I was able to avoid the need for such high wattage. I find the lighting to be more pleasant if it’s more spread out, so the use of lower wattage bulbs make sense. A single bulb at high wattage can be blinding. As for even lighting, that’s what led bulbs are good at. But you have to use them in fixture that designed for them. 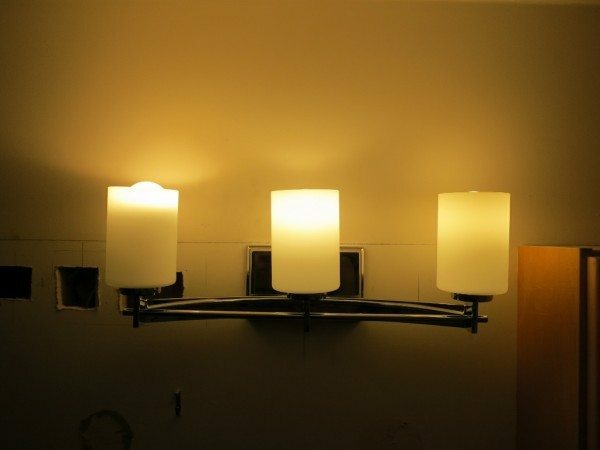 For example, you should use a PAR-30 bulb in a bathroom fixture like the one in one of the photo. Those bulbs are intended for directional lighting such as recessed ceiling fixture or security light. Also, many fixtures were designed to expect light bulbs where the light emitting part is next to the socket. Using an led with an extended base will cast a shadow. The light emitting part of many led however will emit light evenly. I do look forward to trying LED bulbs in my recessed ceiling lights, where they should excel if they fit the fixtures properly. I’ll try them as soon as I go through my stock of CFL recessed lights, which should be soon because they don’t even seem to last as long as the incandescent bulbs. I wasn’t happy with my CFL experiments, but LED technology seems much better. Greg, great job on reveiw. You mentioned you didn’t use the Ultra LED in your garage opener light fixture because it is an enclosed fixture, but the package actually says not to use in an enclosed “recessed” fixture, so doesn’t that mean don’t put it in for example the square recessed ceiling light box that has a flat glass cover flush with the ceiling? I don’t think it means like this garage light. I would think it would be ok too then to use in ceiling fixtures that are enclosed but not recessed like many hall and bedroom lights that fit flush to the ceiling with the half round or fully round globe on them. I am guessing the concern is with recessed fixture in the ceiling with insulation around it and may get to hot for the electronics. Do you have any comment or you have access to Sylvania to find out what they mean exactly? @Bill Wiegand, LED lighting in general is vulnerable to high ambient temperatures, which can significantly reduce the lifetime of a bulb and even cause color shift. Although LED lights do not put out as much heat as incandescent bulbs, the heat that they do generate must be dispersed to prolong the life of the LED. Manufacturers apply various cooling technologies, usually heat sinks with ventilating fins, to combat the problem. An enclosure around the bulb that keeps the heat from escaping reduces the effectiveness of heat sinks. Is a bulb with a warning against use in enclosed spaces going to perform worse than a bulb without the warning? I’m not aware of regulations that dictate when the warning must be used, so perhaps not, but it would help the company resist a warranty claim. My garage door opener completely encloses the bulb in a white plastic cover. The ceiling recessed lighting cans throughout my house are not covered at the bottom, so they may get hot but hopefully not enough to affect the LED lights that are actually marketed for that application. XLEDIA is one company that specifically markets LED bulbs for enclosed fixtures. You’ll also see the Cree bulbs with their prominent cooling fins listed as suitable for enclosed fixtures on sites like EarthLED.com. I have not tested these myself, however. I cannot believe how inaccurate your “review” is and that Osram actually sent these to you. I mean, even in your set ups, you didn’t realize which bulb you were actually using. NOPE – that’s the 60 watt equivalent Osram on the left! Then your next setup, you take the 40 watt equivalent bulb and call it the 60 watt equivalent. The 40 equiv has the small heat sink, the 60 has the larger one. At least remember that, and if you’re in such a hurry to throw together a poor review, don’t take the bulb out of the package until you’re ready to test it so you don’t screw everything up. Also, stop talking about watts. Talk about lumens. Even the govt wants people to focus on lumens now rather than watts, since watts to NOT describe how much light is produced. So for lay people, tabulate how many lumens all the bulbs are, and THEN compare them (it’ll look kind of stupid, since you’re comparing 1600 lumens to 800 in some applications, but hey, it’s your review). For the record, I’ve tried every LED bulb and only one made it into my house. The Osrams. Incredibly omnidirectional, no sound, best LED bulb hands down; go to Lowes.com and read reviews there on the bulbs — my review is there. @Jeff, I’m sorry you were disappointed in my review. You are correct that I reversed the captions of the two lower-wattage bulbs in the photos. I also grant you that lumens is more accurate, especially when comparing different lamp technologies. However, I thought I had made it clear that I would use the replacement-wattage terminology to describe the bulbs for two reasons. The first is that, for now, this is predominantly how the products are marketed by the manufacturers – see the OSRAM packaging itself and compare the font of “100W” vs. “1600 lumens – and I think it will be some time before the general public starts thinking intuitively about brightness in terms of lumens. Secondly, I was specifically discussing several scenarios for replacement of standard n-watt light bulbs in my home. As such, I wanted to test LED bulbs that were specifically sold as n-watt replacement, so I stuck with that terminology. I agree that the OSRAM products are very good, although I’d disagree that they are “incredibly omnidirectional” for the higher-lumen applications that I needed them for in my house. The existing standard for that has been set by incandescent bulbs and, despite their flaws, I haven’t yet found LED bulbs in the 1200+ lumen range that cast light as evenly in all directions. The technology is advancing rapidly, however, so I expect that to change soon. Change that to ULTRA LED 60 as the first item, and the next caption down, change the last item to ULTRA LED 40. When I was speaking omnidirectional, I meant the 60 watt and 40 watt equiv, since… they’re the only ones that even claim to be omnidirectional… Why would I say that the ones that aren’t stated as omnidirectional on the packaging (the 75 and 100 watt equiv) are incredibly omnidirectional? They’re not. Just looking at them you can tell. Plus they don’t claim to be. With that logic sorted out, I implore you to find another LED that is more omnidirectional than the 40 or 60 watt equiv. There are none. Give them credit for that, it’s a BIG deal. They have a 330 degree spread, and if you go on youtube you can see a teardown, how they get that spread, and you can even see mapping of the spread. @Jeff, The captions have been corrected. Thanks again for pointing them out. LED A-line omnidirectional lamps.” And, for example, the “Ordering Abbreviation” for the 100w-replacement lamp is “LED17A21/DIM/O/827/G3,” where the “O” stands for omnidirectional. Certainly, however, they are not as omnidirectional as their lower-wattage siblings. I was focused in my review on which ULTRA LED lamps actually functioned as satisfactory replacements for existing applications in my home. 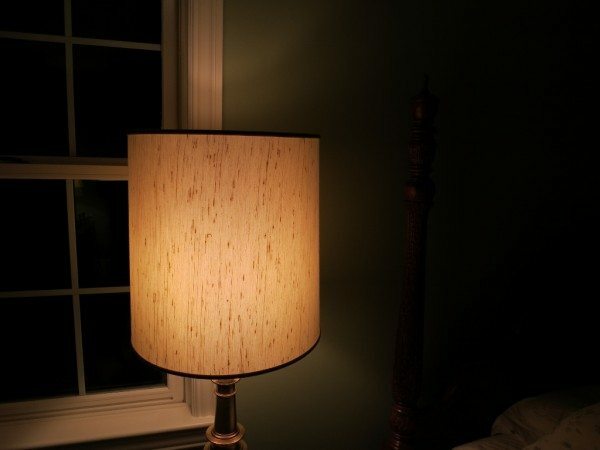 Thus, for me (with aging and glaucoma-affected eyes), the dimmer lamps didn’t receive as much scrutiny, although the LED replacements ARE much closer to being functionally equivalent. As for the 330-degree spread, it is impressive, but I have an “LED filament” A19 bulb from Spotlite-USA that claims to have a 360-degree beam angle (maybe a little marketing exaggeration there?) and I like it a lot. It’s 2700K and about the closest thing to a non-frosted incandescent bulb that I’ve come across. Unfortunately, their line tops out at 800 lumens for dimmable and 900 lumens for non-dimmable. I will be keeping an eye out, however, for brighter versions in the future. I purchased several of the 8.5 W LED bulbs you mentioned in this article(A19 2700k 800 lumens) around Jan 2015. I have had 3 bulbs go out after 9 months to 1 year. One of the bulbs even smoked briefly when it burned out- I actually saw it smoke. The base of this bulb can get very hot. I wonder if there will be a recall on these bulbs in the near future?. I contacted the manufacture , and they indicated they would refund my money or i could take it back to Lowes. I took the bulbs back to Lowes and they refunded my purchase. I have several more of these bulbs in my home and concerned about the stability of this particular LED bulb.. I will probably replace these bulbs with another brand. It’s unfortunate because the bulbs light input is good otherwise. @Roland, I’m sorry to hear about your negative experience, which sounds like what I went through with many types of CFL bulbs. I don’t have a very large sample of the OSRAM LED lamps, with only three in use, but they are all still going strong under fairly heavy usage (more in terms of daily on/off switching than constantly being lit). It is at least good to know that the manufacturer offers and seems to be standing by the 5-year warranty. We just pulled an Osram 8.5 W LED from a hall fixture with a surrounding globe when it began to flicker. We had only had it in place for a year or so and the hall light is only on sporadically when we go up and down stairs or are working in the hall. We were surprised that it seemed to be failing and when I removed it, the bulk and the base were very hot…especially the base including the screw in section. There were no markings on the bulk indicating any limitations on use in an enclosed fixture and an indication that it was ok to use in a humid setting. We expect to replace, but are surprised at how rapidly this bulb failed and by the high heat we discovered when we removed it. 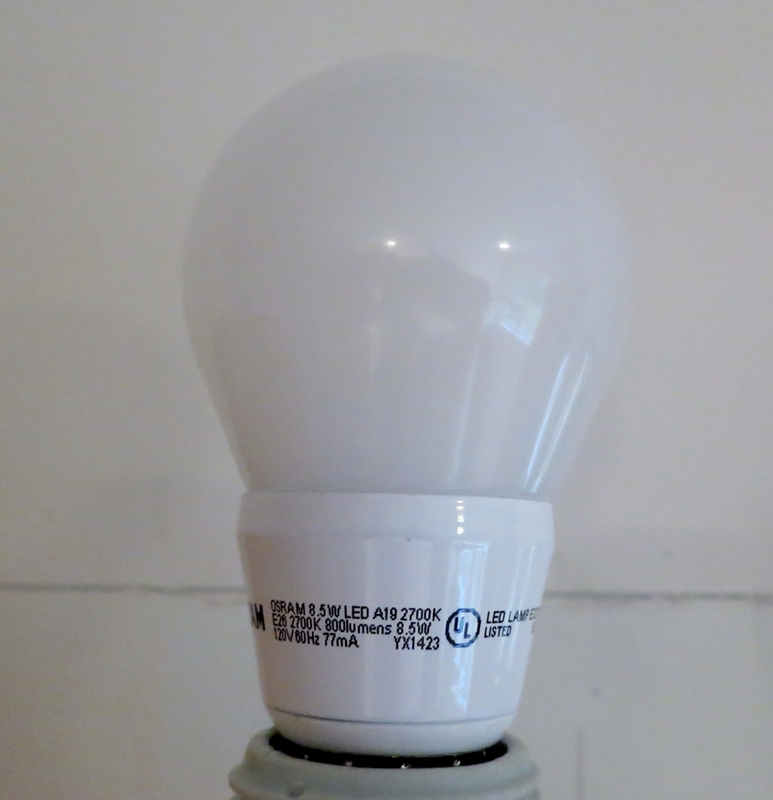 @dweb, I don’t recall whether the warning against use in an enclosed fixture was on the bulb or the packaging, but I definitely saw one, as noted in the review. I have found some LED lights which state they are okay in enclosed fixtures. I’m sorry you had a negative experience. The OSRAM lights that I used for the review are still going strong, so it’s certainly possible that it was the enclosed location that killed yours early. Hello, we have been disappointed too! Our Osram 8.5W LED is running hot as well, we barely use our bathroom fixture over the sink because of it and after barely any use one of them has burned out after 2 years.